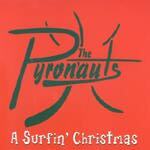 This is the official release of the Pyronauts Christmas album. The sound is delicate, respectful, and traditional. the arrangements are sometimes very simple, yet very effective. many tracks are short, some under a minute. This is a very smooth and enjoyable salute to that new shortboard under your tree.